IF PICTURES ARE SLOW TO DOWNLOAD TRY HITTING 'REFRESH'. DOWNLOAD TIP FOR NEW VISITORS: BE PATIENT AND LET THE WHOLE PAGE DOWNLOAD COMPLETELY ON YOUR FIRST VISIT. THEY WILL THEN BE 'CACHED' ON YOUR PC. ON SUBSEQUENT VISITS THEY SHOULD DOWNLOAD MORE QUICKLY. Early to Mid 70's: The Prime Minister, The Right Hon. 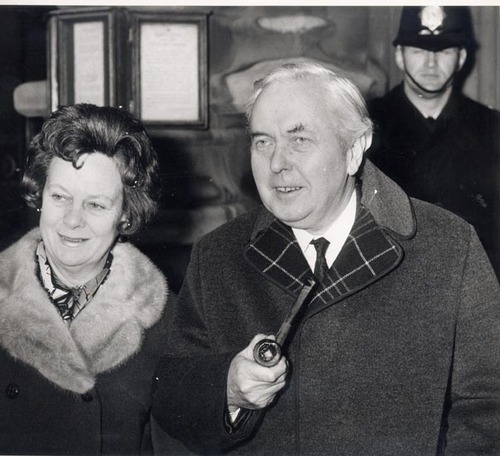 Harold Wilson MP & Wife Mary (JH in background) outside St. Stephen's Entrance, Palace of Westminster. 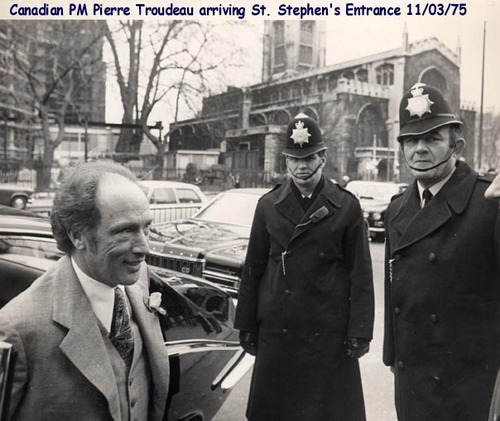 11/03/75: Canadian PM Pierre Troudeau arriving St. Stephen's Entrance, Palace of Westminster (note the nose of The Prime Minister, The Rt. Hon. Edward Heath on right of picture) JH and PS. George Garnham ready for action! 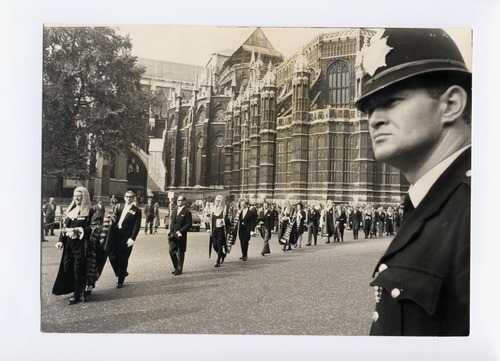 02/10/72: Judges Breakfast Procession from Westminster Abbey to House of Lords to mark the opening of Michaelmas law sittings. 23/10/64: Rt. Hon. R.A. Butler MP & Wife Molly leaving No 1 Carlton Gardens (official London residence of The Foreign Secretary) for the last time as Foreign Secretary(JH lurking in background again!) Note black helmet plate. 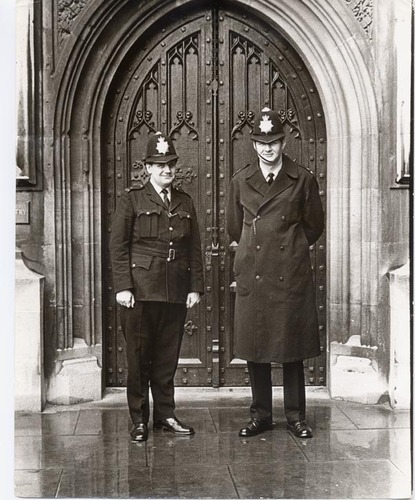 15/03/74: 'Front Row Forward & Second Row Forward' PC 154 'A' Terry Brooks and JH outside entrance to The Crypt Chapel, POW . 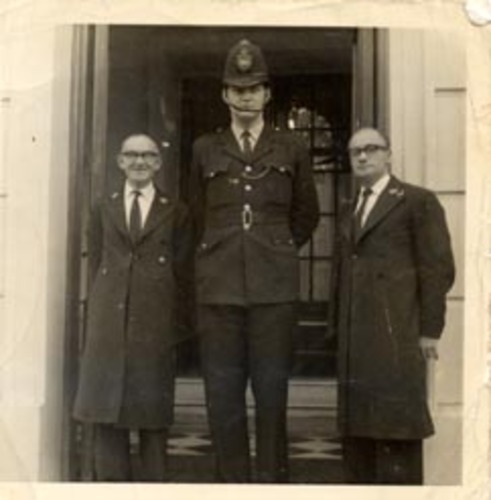 (Terry played prop forward for Old Purleans RFC for many years and JH played second row forward for Metropolitan Police RFC). TO VIEW TERRY AS HE IS TODAY CLICK ON THIS IMAGE. 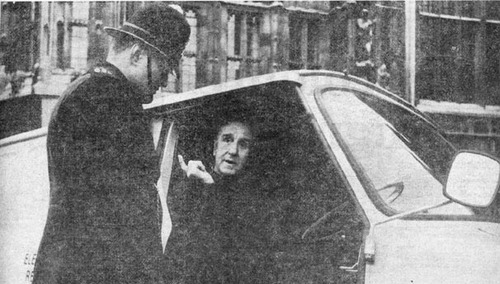 December 1970 Manus 'Jock' Boyle PC 302 A /131139 and JH. Jock has adopted his classic Spencer Tracy stance for the picture (his favourite film was 'Bad Day At Black Rock'). Manus was a 'verbal artist' painting many humourous verbal 'pictures' of his colleagues and events always enhanced by his strong Scottish accent. Early 1970's: 'Hands Across The Sea' !! Welcoming 3 New York Detectives. Old Palace Yard, S.W.1. Early 70's: 'Hands Across The Sea Again??? PC Chris Steil and JH Welcoming 3 American Young Ladies. 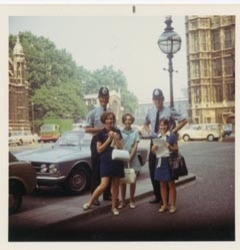 (Note blue shirts) O/S Peers Entrance, House of Lords. 17/11/72 Chatting to Rt. Hon. 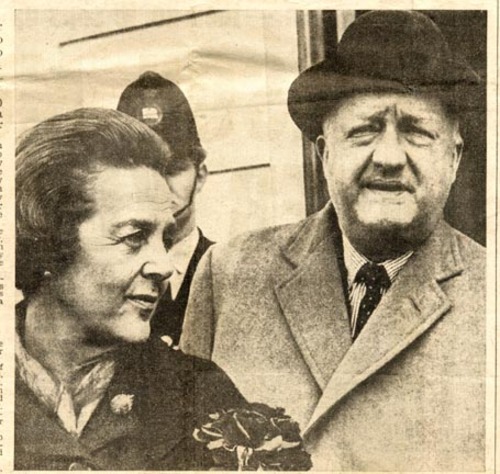 Ernest Marples MP the then Minister of Transport. 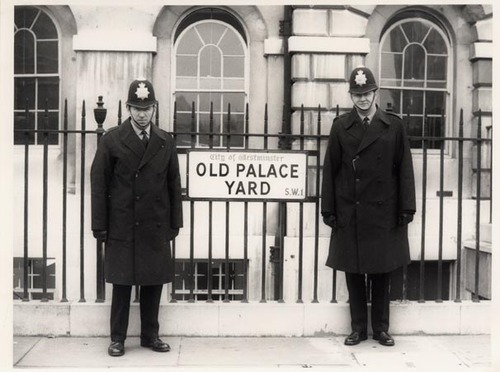 Old Palace Yard, S.W.1. (Mr Marples actually opened the M1 Motorway). Autograph of John Wayne the famous American actor. 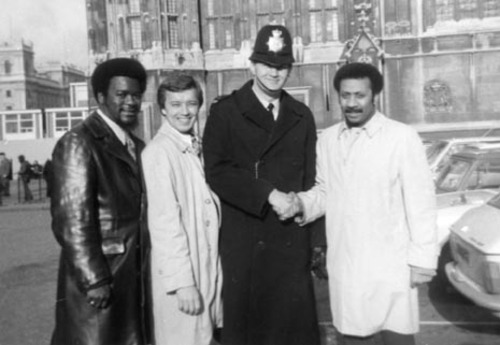 Obtained in Old Palace Yard whilst he was filming 'Brannigan' in London.I escorted Mr. Wayne on a brief tour of The Palace of Westminster. In fact I had John Wayne to myself for around 45 mins. An unbelievable experience indeed! It was billed in the newspapers as "Big John meets Big John". Halt! Who Goes There???? 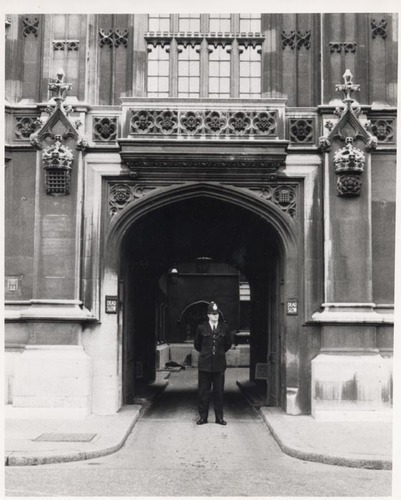 JH at Chancellor's Gate, Palace of Westminster. Below: August 1986 JH (now with Royalty Protection Dept.) 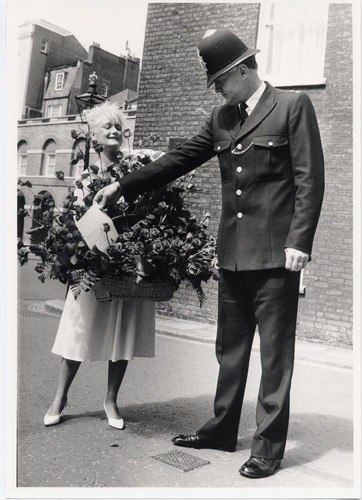 checking out flowers being delivered to Clarence House, St James's Palace, to celebrate the 86th Birthday of H.M. Queen Elizabeth, The Queen Mother.